Once upon a time there was a little old woman and a little old man. The little old woman thought she’d make a gingerbread man. She rolled out the dough, and cut out the shape, and she put raisins for his eyes, and peppermints for his teeth, and put icing on his head for the hair. Then she put him in the oven, and when it smelled good, she opened up the door to take a peek and out jumped the gingerbread man. Today’s Recipe for Fun is Gingerbread Crayons. Preheat oven to 250 degrees. Start by removing all the paper from the crayons and chop them into small bits. Fill your mould with the crayon pieces and place in the oven for 15-20 minutes until wax is melted. You can add more bits of crayon through the melting process so the moulds are completely full. Remove from the oven and leave to cool. Then push out the crayons and they are ready to use. Caution, don’t let them get away until you are ready to surprise some special kids. This Recipe for Fun is from Torie Jayne. How to disguise Gingerbread Men. 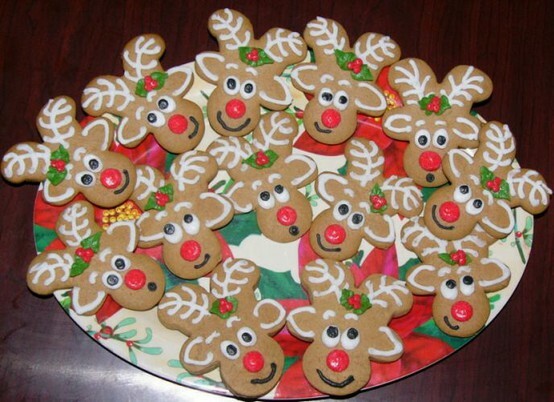 Turn them upside down and look at the cute Reindeer cookies. For a change of pace, how about baking up some Nijabread Men? These Nijabread Men cookie cutters have been a hot item this season. Can you see them also as a Recipe for Fun?